LUCENA CITY – House Minority Floor Leader and Quezon 3rd District Cong. Danilo Suarez won over Quezon 2nd Dist. Cong. Vicente ‘Kulit’ Alcala in a mock online poll survey conducted by Sentinel Times. The ST online poll asks the question: Who is your incoming governor? Quezon Reps. Vicente ‘Kulit’ Alcala or Danilo Suarez? 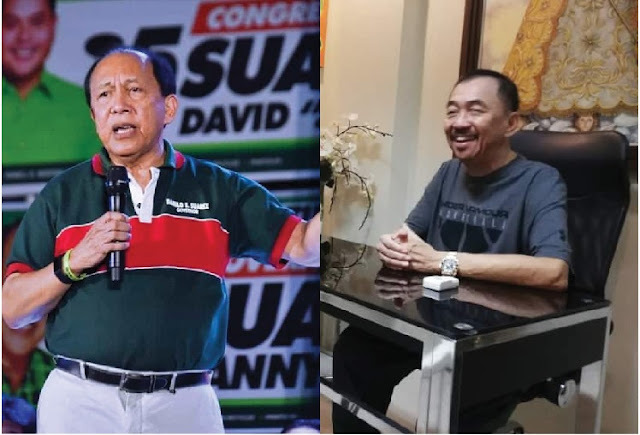 Both Alcala and Suarez have filed their candidacies for provincial governor of Quezon in the midterm elections on May 13, 2019. Suarez got 484 or 59% while Alcala got 337 or 41% of the total 821 votes cast on the online voting as of Sunday, April 7, 8:52 am. The online poll, which started on Mar. 31 at around 8:02pm, got 39 likes, 71 comments and 71 shares. The online poll is accompanied by a news article titled “Alcalas, Suarezes to collide in Quezon” written by Gemi Formaran on Jan. 12, 2018. Formaran is a news correspondent of People’s Journal, a daily national tabloid and a news contributor for Sentinel Times, a local weekly newspaper circulating in Quezon province. Also the online poll shows a photo of Alcala descending on a wooden plank from a motorboat and Suarez waving on the ground while a chopper stands by apparently both on their separate campaign trails around the province. Various other comments said: “Alcala subok na” from Nora Siman Gutlay and Cora Estrella; “Solid Suarez po” from Felix Samson; “Suarez lang ho mula noon hanggang ngayon. Mabuhay po. Godbless,” from Carmensita Holgado; “Gov. Danny and Cong Jayjay sa 2nd District” from Melojean Alcantara, “Gov. Kulit Alcala po tayo. Para hindi lang bagong Lucena kundi bagong 2nd and 3rd district of Quezon” from Will Molera; “Alcala” from Manolo Magadia, Micaella Manalo and Benito De Lumban”; “Wala pong iba, Suarez po syempre” from Anna Marie Morales” among others. The online poll drew some negative comments such as from Realtalk who accused ST of being ‘biased’ when Alcala seems to be gaining the upper hand. The ST online poll has this clear Disclaimer: Ang online poll na ito ay hindi siyentipiko. Hindi ito kumakatawan sa mga opinion ng publikong Pilipino sa kabuuan. Ito ay isang reaksiyon lamang ng mga online visitors ng http://www.sentineltimes.net/ at ng https://www.facebook.com/SentinelTimesOnline na kusang sumali sa poll. Jose Marlon Yasay, a radio reporter said about the 2019 Quezon gubernatorial race between Alcala and Suarez: “Kinabukasan ng lalawigan ng Quezon ang nakataya dito . . . maging ng mga susunod na henerasyon”. Alcala, who filed his Certificate of Candidacy under the PDP-Laban party, has served as a barangay chairman of Cotta for 18 yrs. before he was elected as provincial board member in 2nd district then vice governor and finally congressman. He said that if elected governor he will serve for only 1 term just to show to his fellow Quezonians his desire to make the necessary reforms for the province. His runningmate for vice governor is former 4th district board member Narciso Malite. Suarez, a Lakas-NUDP stalwart, has been congressman in the province’ 3rd district for over 2 full terms and now wants to succeed as governor to sustain the development programs started by his son, Gov. David ‘Jayjay’ Suarez, the incumbent governor since 2010. He is running alongside incumbent vice governor Samuel Nantes.